That’s either a brilliant bit of investigative journalism, or a wind-up lead to a cartoon! MoS story is total nonsense. As I made clear in a full media round on Friday, Ed Miliband is the right person to lead Labour and Britain. That’s quite a damning article. So either the difficulties within the PLP are, in fact, severe : or the Mail has printed a tissue of lies. That tweet from Hunt isn’t, in fact, a denial that he said what he was quoted to have said. Labour ahead in polls, what a load of fuss over nothing in the media. I just can’t see any party changing leader this late in the day. The situation in UK politics all round at the moment is so bizarre, it feels like being in an alternative universe. I’ve come in after cheapo Grand Prix qualifying (Beeb highlights). I can’t make head or tail whether people are quoting real polls or otherwise with all this pantomime talk. Seems peculiar that Survation did a poll just after they had already done one. Tristram Hunt couldn’t be any clearer, could he? Nothing wrong with an alternative universe! Well LiS are in the process of changing the leader of what they sometimes suggest is a “party”. Yes, well I really only posted the link to verify the Chuka poll numbers that were in question earlier and they are embedded in the story. Lets not upset Anthony by discussing who said what when. 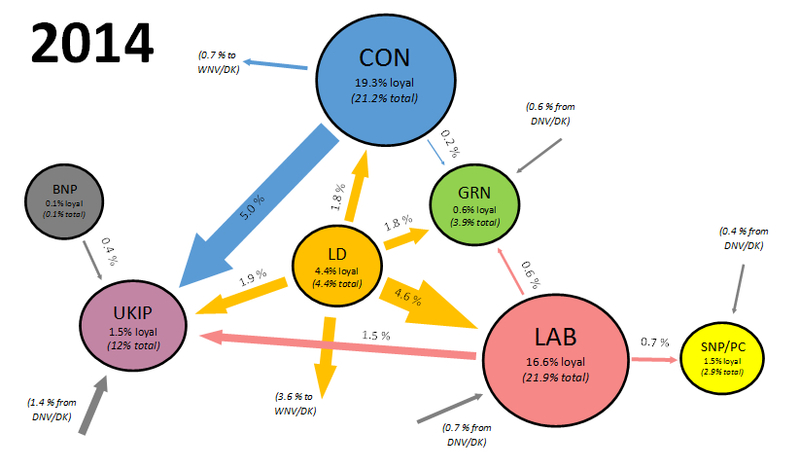 I found it interesting that the Tory vote share changes depending on who the Labour leader is, from 29 to 32, and Labour vote share goes from 31 to 37. It will be interesting to see happens to other parties do with each possible leader when we get the tables. I’ve come in after cheap* Grand Prix qualifying (B*eb highlights). I can’t make head or tail whether people are quoting real polls or otherwise with all this pant*mime talk. Seems peculiar that Survation did a poll just after they had already done one. Reel yourself in and have a look at what this wielding of the dagger by Hunt actually amounts to. “He said: ‘I never believed the answer to Labour’s problems was to show people more of Ed Miliband. It was a ridiculous idea dreamed up by his advisers who have served him badly. I didn’t take you for the sort to wet their pants at a ridiculously overblown Dacre headline. Reading a politician’s actual words is something I often find helpful. In previous years the levels of support the big two are getting would have been enough for a leadership challenge, but for the life of me I could not pick a better pair than we have now in EM and DC. That is not to say they are doing well, more like the rest are that bad. I have been wordpr*ssed so here’s another go. Are we really to believe that voters have even heard of half these people? A) Hunt, apparently, said that the re-launch had been a disaster. Self-bleeding-evident. B) He said that EM has excellent qualities and had been let down by his advisers. Self-bleeding-evident. C) He said that the STORY in the MoS (with a screaming headline about Hunt sticking in the dagger) was nonsense. Self-bleeding-evident. Which of those three self-evident things are you struggling with? Good old Eoin, I miss his contributions here, especially in discussion with Rob Sheffield. Gosh -reminiscences about UKPR already. 2. Hunt not denying the terms of the words attributed to him. I explicitly stated that the Mail being economical with the truth was not an unlikely situation. This site is not about the virtues or vices of particular political parties, but the effect of events on likely polling VI as well as the polls themselves. The more I re-read that MoS piece, the more it looks like another of their conditions from the “Man who hated Britain” file. A headline designed to frame the news agenda, followed by an article that does not in any way justify the headline. But it works. It’s working in some supposedly intelligent people in here. About a week ago some senior Lab figures came to Ed indirectly and said Labour’s approach had to be more of a team effort as selling EM and only EM wasn’t working. EM responded by giving other cabinet members the freedom to appear more regularly in the media and voice their own thoughts, and appointed someone to coordinate the massage and issue more rapid rebuttals. That resolved matters. Then the press got win of the earlier issues and suggested they were still ongoing. They were not. So I guess TH’s comment in the Mail (if true) are old hat – communicating the original criticism – which has been addressed. This is a test on the word ‘pecul*ar’. Ah got it. So now you know – don’t use that one. “Conditions” = “concoctions” a few posts back. Regardless of the ins and outs of this – it isn’t very interesting. If you watch politicians (you do of course) they have become so used to skating around a subject, that, even when it would be in their best interests just to be straightforward, it’s just not possible for them to do so. Their problem, with which I have some sympathy, is that if they are straightforward, they are immediately pilloried by those who have it in for them. Statgeek, Anthony – thanks so much for the links. I dug into Anthony’s links before seeing Statgeek’s. Hopefully they are similar. I then made my simple analysis (using Anthony’s article and 2010 results), which has obvious flaws as the numbers show. I’d love to finetune this model and somehow adjust for incumbency+regional effect, but I guess those kinds of models are hard to get right – at least not without a different initial dataset. Still – it’s quite instructive. 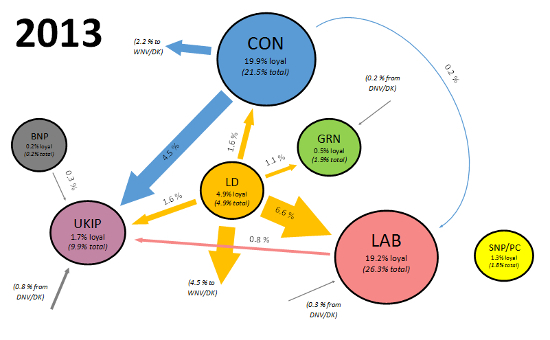 Also, I do love one thing about the model: It doesn’t end up with crazy maths like UNS does – it ends you up at the exact some number of total voters in each constituency. The MoS claims that Britain’s leading polling expert (Curtis) says that the Survation poll suggests ditching Miliband would give Labour an additional 50 seats – increasing its forecast majority from 40 to 90. They seem to have failed to realise that means an additional 25 seats – not 50! Furthermore if Miliband won with a 40 seat majority (51 seat majority when you add the SDLP to the Lab benches & count out 5 Sinn Fein seats) and beat the Tories by 4 or 5% – that would be broadly comparable with Blair’s 2005 win. I’m not that fussed about who leads the Labour Party. I voted Andy Burnham 1 & Ed Miliband 2. Alan Johnston is a nice chap. But I doubt he’s going to be shooed in as leader. And we’ve seen Tristram Hunt targeted before: In Cameron’s speech to conference no less! – The UKIP gain was actually missing data (and UKIP being the “default winner” because it gains the most from “DNK”). 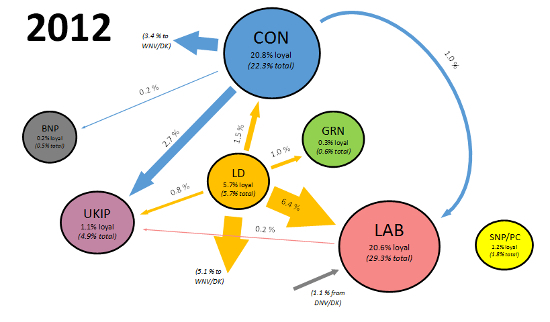 – And then Thurrock (4.5% from Lab). – UKIP has three seats less than 5% points away and around 75 seats less than 10% points away. So this does reveal quite interesting figures (however problematic some seats certainly are), and makes me think it can’t be hard to cook up some convincing stats that would look impressive enough to talk about UKIP having some 50-100 target seats in six months. “These labour figures who are feeding this media frenzy should have the decency to say who they are”. I don’t think expecting “decency”, in the normal use of the term, can ever be expected from plotters in any party at any time. What I find incomprehensible is that it is happening at all, 6 months out from an election. Back-stabbing and the pursuit of personal advancement is hardly unknown in politics, but this is being done through the media via journalist briefings. It seems an insane way for MPs who hope to sit on the other set of benches to behave. with link to videos, tables etc. earth do they hope to achieve? If the election was a head to head contest between David Cameron as Conservative leader and Ed Miliband as Labour leader, how would you vote? Obviously I must have missed all those pieces about Cameron’s leadership crisis. Frankly tonight’s polling figures are in totality better than I had expected for Labour after such a sustained and exceptional onslaught on Miliband over the past week. I don’t think that it can go on for much longer at such intensity provided that the party collectively continues to hold its nerve and doesn’t provide any real news to give it substance. There is also a limit to how far these stories can be sustained without invoking some sort of reaction from the public along the lines of empathy for Miliband from those prepared to give Labour at least the time of day. (A point which seems to have eluded Pressman.) In the circumstances 32% to 34% isn’t that bad if it’s viewed as a floor from which to try and recover the extra 2% or 3% that is all that’s needed. 2. Concentrating on the views of current Labour voters as to their views of Ed. These are people who plan to vote Labour anyway. Of more value would have been the views of those who might (but don’t currently have) a Labour VI. I posted mine without reading yours but that’s an example of exactly what I meant. The last couple of postings sensible and balanced as regards EM “leadership crisis”. I agree with AW – some of the partisan postings on here recently not worthy of this site – some names I now see and simply skip and do not even bother to read any longer. The ICM poll has surfaced in the Telegraph. However it is not a VI poll but a Wisdom Index poll. The Tories lead Labour by 31-30. Do newspapers regularly publish the Wisdom Index? Yes, the Wisdom Index appears regularly. In that article I linked to last night, there were persuasive arguments that in the context they were examining, predictions were more accurate than VI. Unfortunately, for those looking at them now, that really only applied to those taken a month out from polling, or later! So worth looking at them again in late March/early April might be useful. In these circumstances one would expect a massive closing of ranks. I think I’ve heard Ed Balls and David Blunkett make supportive noises in the last few days. If Burnham, Cooper, Umunna, enough shadow cabinet members and Labour officials (as well as Johnson) present a united front tommorrow that will be the end of the matter. RAF – only when it suits and opinion polls not shifting in the way they think they should have! Presumably that’s either a sane Lab MP saying that this nonsense can’t go on for the next 6 months, or (just possibly) a plotter raising his nostrils above the water? I should of course have included Harriet Harman in that list… she hasn’t been in the news since wearing a t-shirt. You old tease ON !